Once they wed, Tullia got to work. She wanted the Crown! She started talking to her husband, telling him how he would make a much better King than her father. She offered him suggestions on how he could achieve this goal, and she manipulated him right where she wanted him. In time Lucius was convinced that he would make a better King, and that it was his right, as he was married to the King’s daughter. He began the subtle game of politics, soliciting support from the senate, bestowing presents, speaking ill of the current King etcetera. She returned to her husband’s house in this manner, and legend states that her appearance offended the gods. It was determined that a reign that started so badly, could only end badly as well – and that determination was correct! Years later an uprising ended the Roman monarchy and started the Roman republic. King Lucius and his Queen, Tullia, were exiled from Rome. 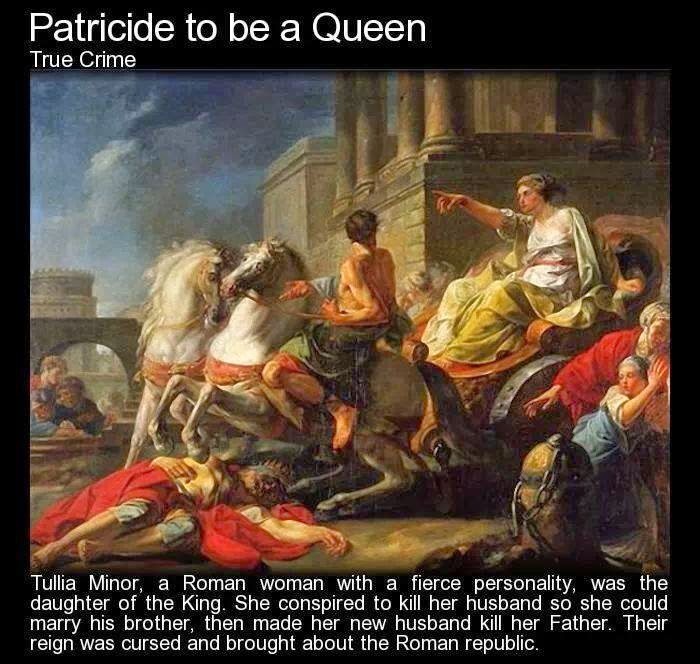 Tullia has been particularly cursed by the great legends of Rome, given her role of Patricide, in the murder of her own father. Picture: Tullia crushing the corpse of her father.